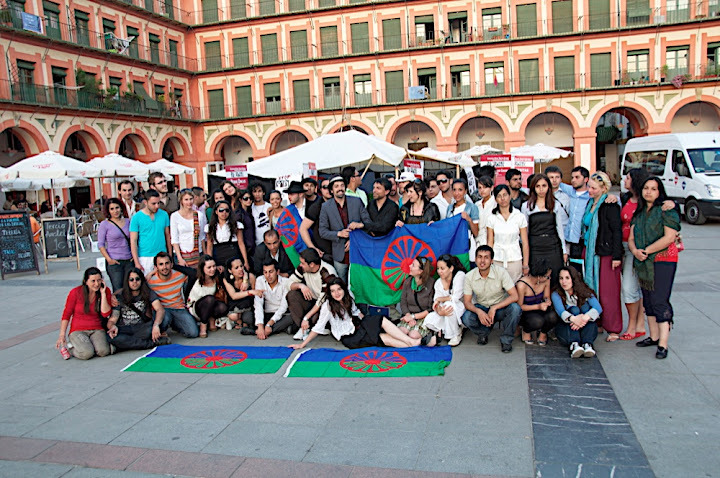 While the Spanish EU Presidency invited hundreds of politicians and Roma activists to the 2nd European Roma Summit in Cordoba in April 2010 more than 60 young Roma from across Europe organized the first European Roma Youth Summit, which took place from April 7 to 9. In discussions, creative and artistic performances, actions of the youth campaign "Be young, be Roma", information booths, music, art and culture the young people from 12 European countries presented their vision and their commitment to fighting stigma and discrimination against Roma. In addition they called for greater participation of young people in political decision-making. Special themes of the workshops were organized by and for young people to discuss their problems and share their experiences. Even if we were unable to attend the official Summit, we wanted to show that we are actively and productively engaged in discussions and develop our own ideas and visions. The program of the first European Roma Youth Summit under the slogan "Be young, be Roma" included art, theater and cultural performances of the international youth from 12 countries, which were prepared during a seven day training-course based on professional artistic guidance. The young Roma wanted to raise the public awareness of their involvement as active citizens and equal actors in society. On behalf of "ternYpe" the youth demanded to the European politicians and parliamentarians to care more about youth issues and to put it stronger on their agenda. Roma young people must also be involved in decision-making processes to strengthen a positive image of the Roma and their voice against discrimination and stigmatization. The young participants had the attention of many European politicians and people from Cordoba on their side. The creative street campaigns at the entrance of the EU summit ensured a high attention. Many of the politicians and representatives of civil society organizations attended the performance and exhibition at the Plaza de la Corredera. As a result, there was an invitation for the second day of the official summit for 12 representatives of "ternYpe". They got the opportunity to have a meeting with the Vice-Minister from Spain and representatives of the European Commission. The youth campaign also seeks to strengthen the awareness of identity, critical reflection and self-confidence of young Roma. Many young people have difficulties with their cultural background because of the ongoing experience of discrimination. We want to challenge the stereotypes and prejudices and show the multitude of young people and their lifestyles. We want to strengthen role models to take responsibility. For example national youth networks contribute to an open space for discussion, getting to know each other and to exchange ourselves. The training course and the European Roma Youth Summit is an initiative of "ternYpe". Itis supported by the European Youth Programme "Youth in Action", as well as OSCE-ODIHR, ERGO network and its campaign "Typical Roma? ", the Foundation "Remembrance, Responsibility and Future" and the Consell de la Joventut de Barcelona.